Flower Garden and Gift Carroll Iowa!!! 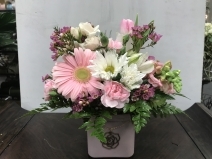 The Flower Garden is your full service florist delivering both local and nationally. We feature fresh flowers, permanent botanicals, flowering plants, silks, and foam flowers. We also have a large selection of home decor and can create a one of a kind permanent arrangement. Our Little Sprouts room is full of unique and different childrens items ranging from clothing, toys, frames and stuffed animals. has pictures of some of our wedding designs that we have done. and create what you are envisioning. The Flower Garden, where the flowers are always "flower garden" fresh! VALENTINE'S DAY! February 14! Don't forget to show your loved one how much you care! 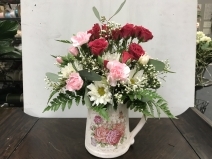 Send them a fresh flower bouquet or give us a call and we can choose a gift from our shop! We have perfumes, lotions, candles, frames, etc. You can also add any of these gifts to a flower arrangement.